In images and text, Ronald Coddington sets out to uncover a compelling history of the black man’s role in his own emancipation. 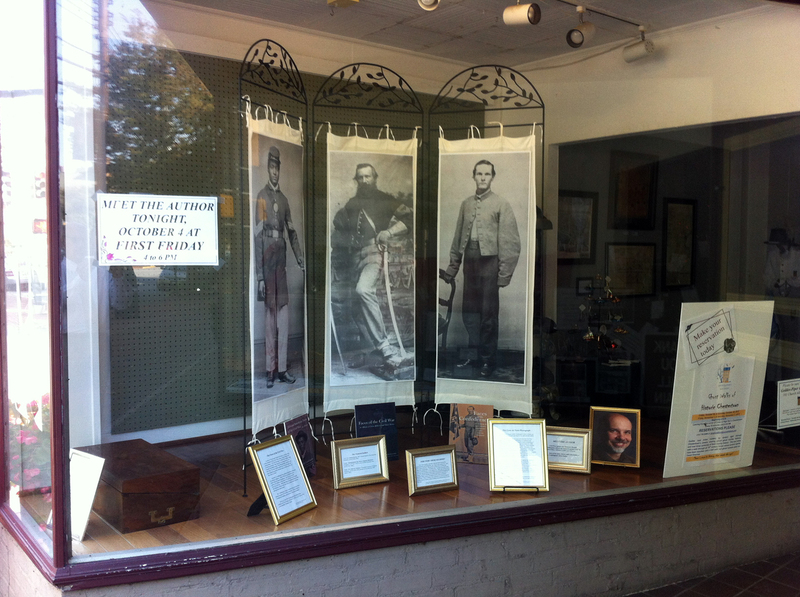 African American Faces of the Civil War comes amidst an onslaught of books and exhibitions commemorating the 150th anniversary of the signing of the Emancipation Proclamation and focusing on the officers, laborers, and soldiers—known and unknown, black and white—who served in the Civil War. Until recently, scholars have written little about the contributions of African American men to the war effort. This book stands as one of the first photographic albums connecting portraits of black soldiers to ideas of democracy and patriotism that were current at the time. The book engages the reader with ideas about citizenship and self-representation as they were fashioned through the camera lens with uniformed soldiers, standing alone or in pairs, holding flags, banners, or arms, and posed in front of illustrated battlegrounds. 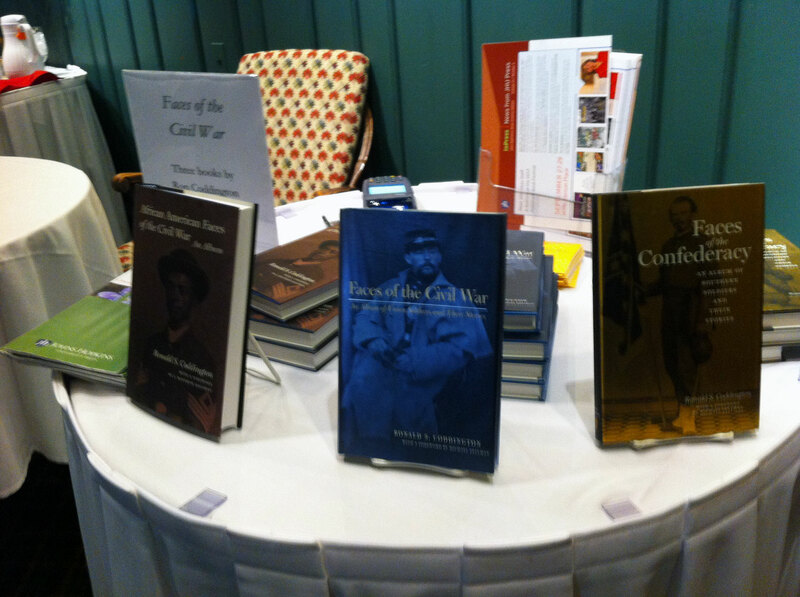 Next to the portraits Coddington provides short biographies of the men who fought and labored in the war. The narrative explores their sense of strength, commitment, and courage, before, during, and after the war. Hardworking, hypermasculine, and well-intentioned fighters, some survived the war to lead exceptional lives; many—even with the challenges of late nineteenth- and early twentieth- century segregation—managed to raise families and build communities. As Coddington writes, even the opportunity to fight was initially denied them. Both the Union and the Confederate armies implicitly and explicitly excluded African American men from their first call-up in 1861. Many of the men who eventually served did so by protesting to the government. 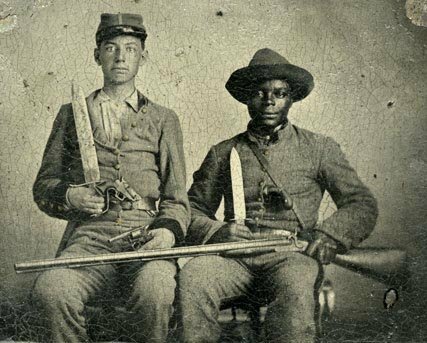 As the war became more strenuous and manpower more scarce, however, African Americans were eagerly recruited to fight. Some joined local regiments as they were formed; others traveled great distances to enlist with a particular regiment. The 54th Massachusetts, for instance, drew its ranks from Canada, Ohio, Indiana, Vermont, New Hampshire, and Rhode Island. Coddington’s depiction of the “brave, aggressive, fearless, uncompromising” (p. 152) Milton Holland of the Virginia-based 5th U.S. Colored Infantry, makes clear the commitment that black soldiers had to achieving full citizenship. In his portrayal of Holland and others like him, Coddington contributes to the recent critical writings on the self-emancipation of Civil War soldiers. Yet he does not shy away from controversial relationships between slave masters and enslaved soldiers. An entry entitled “He Aided His Wounded Master” chronicles the lives of Silas Chandler and his owner, Sgt. Andrew Martin Chandler, Company F, 44th Mississippi Infantry. A tintype portrait shows Silas seated on a lower chair as Andrew sits a head taller on a high chair. While the posing clearly indicates Silas’s status as inferior, both appear well armed for battle. This portrait and Coddington’s informative yet complex text suggest a sympathetic read of this master-servant relationship. In developing parallels between the control of one’s image in narratives and the use of the photograph as biography, Coddington makes a compelling argument for the reader to rethink the place of photography in telling history. His use of photographs as visual text allows the reader to reimagine history through the photographer’s lens. 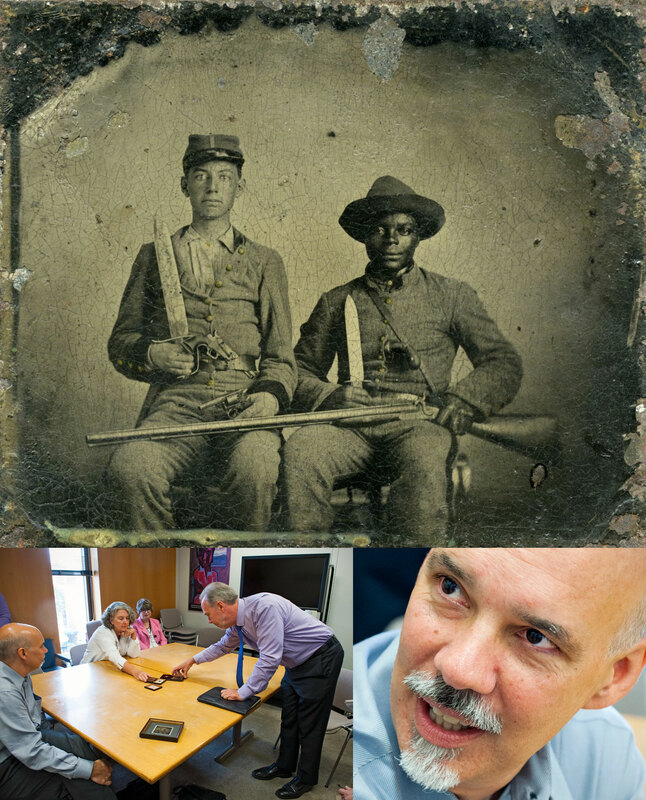 This book maps new methodologies for researching and writing about photographs and plumbs the hidden history of the Civil war narrative. Deborah Willis is University Professor and Chair of the Department of Photography and Imaging at Tisch School of the Arts, and a faculty member in Africana Studies in the College of Arts and Sciences, New York University. Fred Rasmussen, who writes the popular column Back Story for the Baltimore Sun, featured African American Faces of War yesterday. 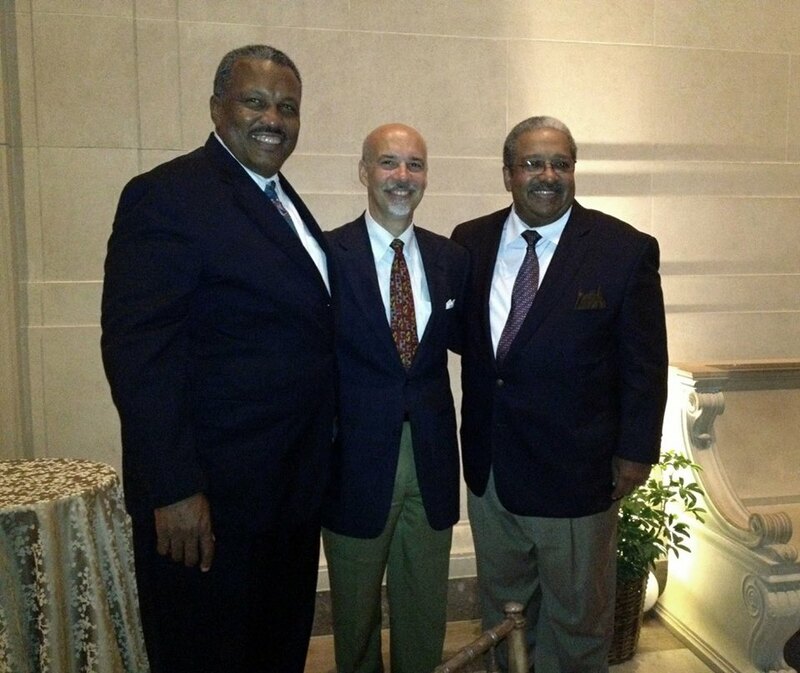 Fred attended my recent book talk at the Johns Hopkins Club, and I thoroughly enjoyed having he opportunity to meet him. Fred was born in raised in Dunellen, N.J., only a mile or two from my boyhood home in Middlesex. Some 200,000 African-Americans enlisted in the Union army or navy — some of them were free while others were runaway slaves. They served as soldiers, servants or laborers. 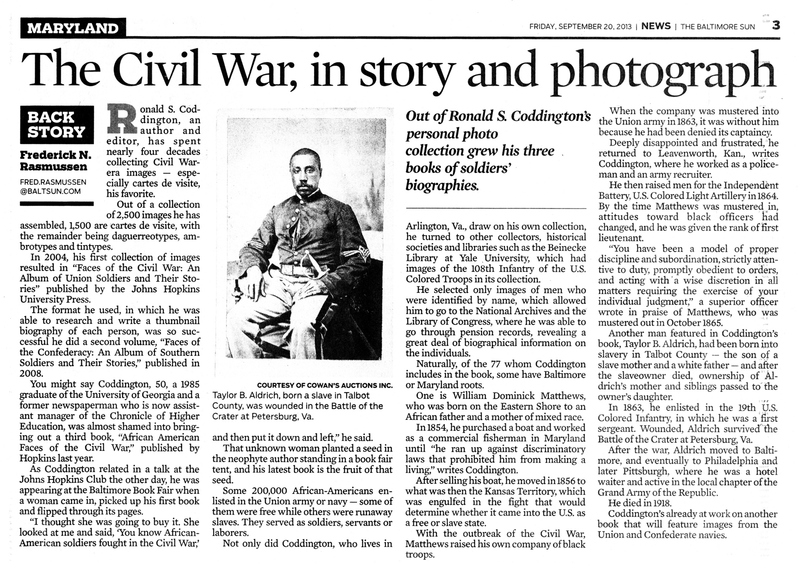 Not only did Coddington, who lives in Arlington, Va., draw on his own collection, he turned to other collectors, historical societies and libraries such as the Beinecke Library at Yale University, which had images of the 108th Infantry of the U.S. Colored Troops in its collection, for instance. He selected only images of men who were identified by name, which allowed him to go to the National Archives and the Library of Congress, where he was able to go through pension records, revealing a great deal of biographical information on the individuals. Yesterday I spent a delightful afternoon at the Hopkins Club, which is located on the picturesque Homewood Campus in Baltimore. The Club has a lunch lecture series, and in this first event of the academic year I was honored to talk about African American Faces of the Civil War. The room was packed, including several friends from Hopkins Press: Acquisitions Editor Bob Brugger, Publicist Robin Noonan, and Development and Publicity Officer Jack Holmes. 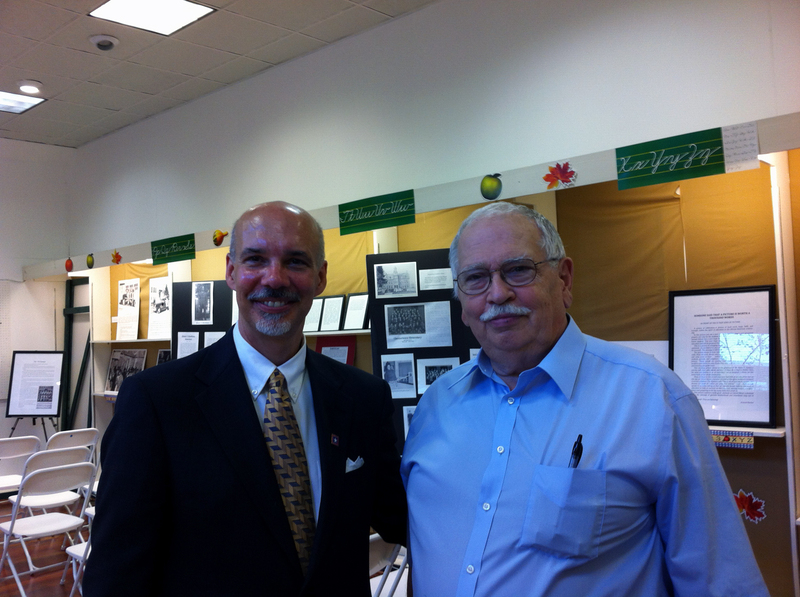 Also in attendance was Fred Rasmussen, a well-respected columnist at the Baltimore Sun. Turns out Fred and I grew up about a mile-and-half from each other in New Jersey—Fred in Dunellen and I in Middlesex. 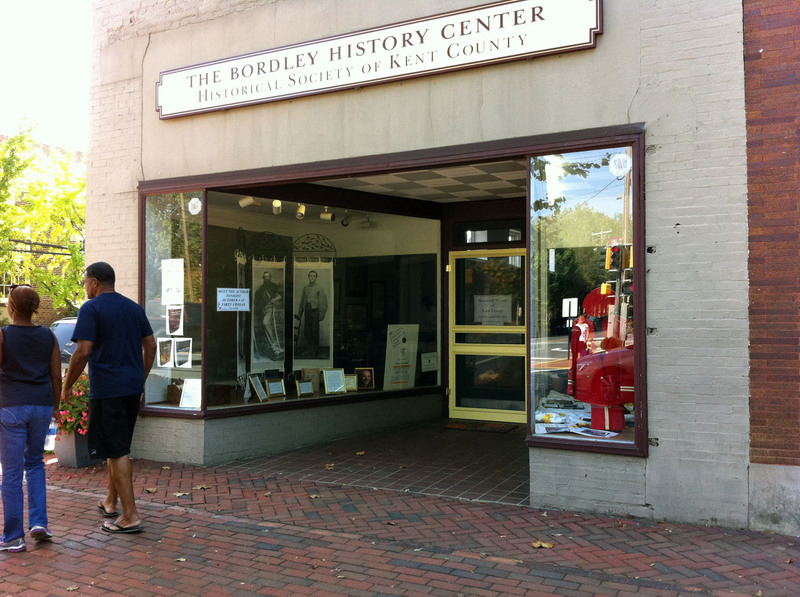 Fred’s passion for his work and interest in history was clear from the moment we met. The event was not without its drama on the roads. A car accident on the Beltway doubled a normally hour long trip. Road construction further slowed my progress. With less than 15 minutes before lunch began, I gave up my attempts to bypass the construction, hastily found a parking space across from the campus, and set out on foot. I made it with a few minutes to spare! 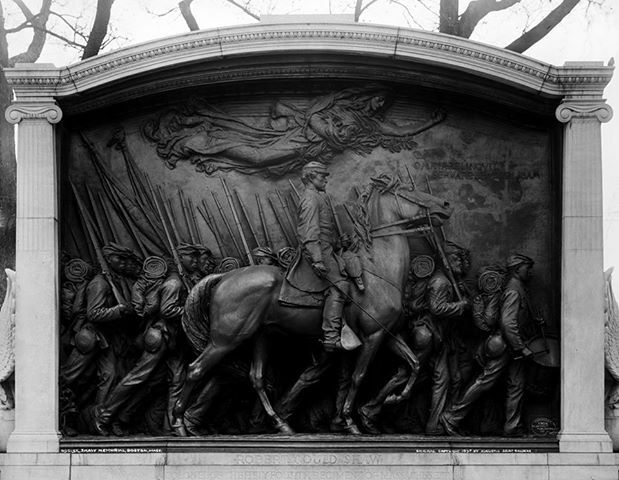 The memorial to Robert Gould Shaw and the men of the Fifty-fourth Massachusetts Infantry is a masterpiece of American art. It is also a moving monument to the sacrifice of soldiers in war. It is however also a seminal moment in the history of race relations in the United States that illustrates a core narrative at the heart and soul of our larger Civil War story. This attractive volume is the third in a series of books on Civil War portraits, by Ronald S. Coddington, assistant managing editor of The Chronicle of Higher Education. His first book, Faces of the Civil War, depicted Union soldiers, and the second, Faces of the Confederacy, showed Confederate soldiers. Each of the author’s previous volumes included 77 images, accompanied by brief biographical sketches pieced together from various sources, including newspapers, regimental histories, and the military service records and disability pension records that are available at the National Archives. This book follows the same format, and its images include cartes de visite, ambrotypes, and tintypes, which come from public archives as well as several private collections. The images include infantrymen, cavalrymen, artillerymen, sailors, and a few noncombatants. The last category includes Robert Holloway, who was Maj. Gen. Ambrose P. Burnside’s servant, and a slave, Silas Chandler, who went to war with his Confederate master, Sgt. Andrew M. Chandler, of the 44th Mississippi Infantry. The tintype of the Chandlers also appeared on an episode of PBS’s Antiques Roadshow. 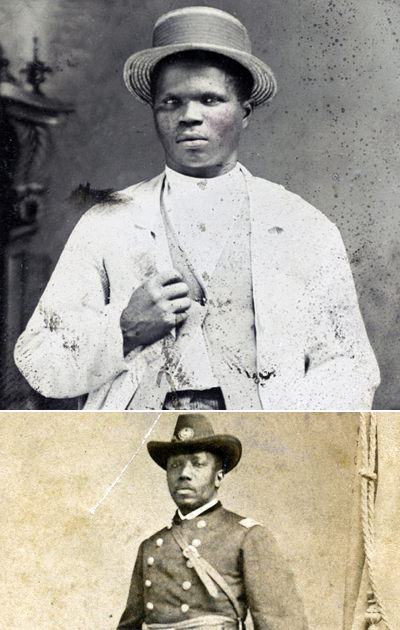 The rest of the images show the men, both freeborn and enslaved, who enlisted in the U.S. Colored Troops (USCT), as well as a few sailors from the Union navy. Among the USCT images, there are a handful of officers, including Maj. Martin R. Delany, who served in both the 104th and the 52d U.S. Colored Infantry regiments. Capt. Louis A. Snaer, of the 73d U.S. Colored Infantry, was awarded the brevet rank of major for his gallant conduct during the assault on Fort Blakely, Alabama, in April 1865. Another soldier who wanted to be an officer but was denied that goal was Sgt. Maj. Christian A. Fleetwood, of the 4th U.S. Colored Infantry. Fleetwood was awarded the Medal of Honor for the heroism he displayed during the Battle of New Market Heights, which was fought near Richmond, Virginia, in September 1864. After the war, however, Fleetwood was able to secure a commission as a major, commanding one of the black battalions in the District of Columbia National Guard. A few of the men who are depicted left the USCT after the war and enlisted in one of the six black regiments—four infantry and two cavalry—that were added to the Regular Army in 1866. These black regulars have come to be known as the “Buffalo Soldiers.” After serving in the 108th U.S. Colored Infantry, Solomon Starks enlisted in the 9th U.S. Cavalry in 1866 and rode with that regiment to west Texas, where he died from dysentery at Fort Davis, a year later. Kendrick Allen also served with the 108th and after mustering out of the Union army and working as a stonemason for five years, he spent ten years in the 24th U.S. Infantry, before enlisting in the 9th Cavalry in 1881. Allen finally retired from the Army as a sergeant in 1897. All those who are fascinated by Civil war photography or black history in general will find this volume to be a most enjoyable read. 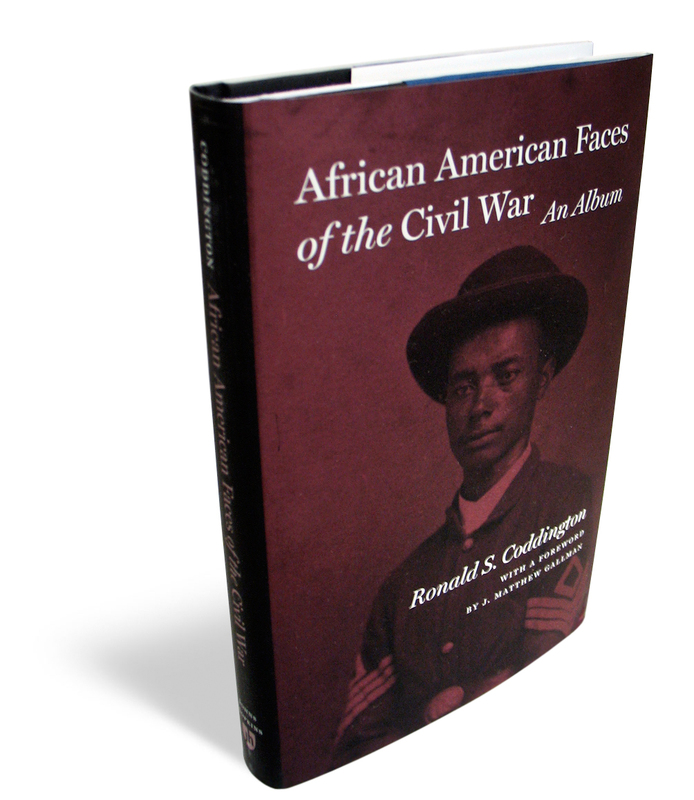 The book helps us to remember that during the Civil War a significant number of black men were willing to fight for their freedom or to help secure freedom for their fellow African Americans.